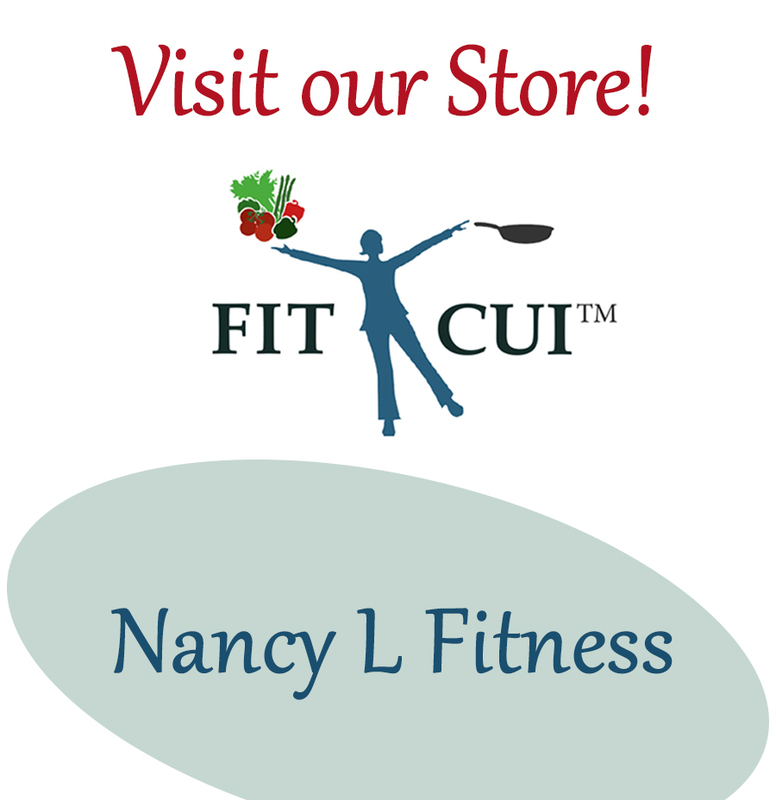 March 3, 2015 July 10, 2016 Nancy L.
Circuit training is a programmed series of body conditioning exercises set on a specific course. Weight training and aerobics work well for this purpose. The time between exercises in the circuit is short; move rapidly the next exercise. After completion of the prescribed circuit, repeat it starting at the first exercise. Continue to repeat the circuit until the set amount of time is up. Since each exercise station changes up the muscle group being worked, no rest is needed when moving between sets of exercises. The exercises are performed in rapid repetitions which raises heart rate. When the heart rate is boosted lots of calories are burned. When done with the session, calories will continue to be consumed for a few hours more. You decide what exercises to include in the series. The course can be quite simple or complex, whatever suits your needs. A typical circuit should work each section of the body. An example circuit is described below. #1. Run in place as quickly as possible. Pump arms while moving legs. Easier: slow down or march in place. More difficult: raise knees higher (to chest). Do this Warm-Up for 2 minutes only at the beginning of circuit session. #2. 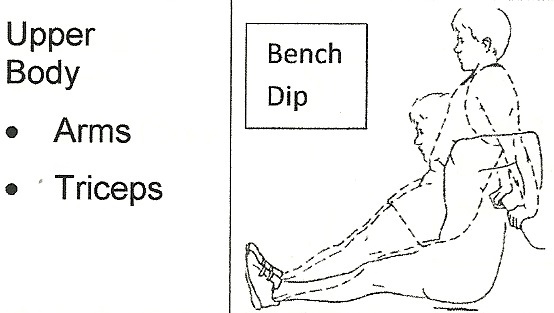 Bench Dip: Keeping elbows close to sides, lower body almost to floor. Then press upward until arms are straight. Easier: Knees bent and feet flat on the floor. 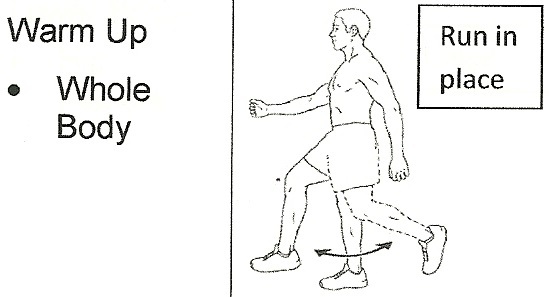 More difficult: Straighten legs; put feet on chair in front. Do 10 reps per set. #3. Crunch – Bent Knee: Lay on back, knees bent, arms straight at sides. Keep head & neck in line with spine, tighten abs. Raise shoulders & upper back toward ceiling. Low / middle back & arms stay on floor. Do 15 reps per set. #4. 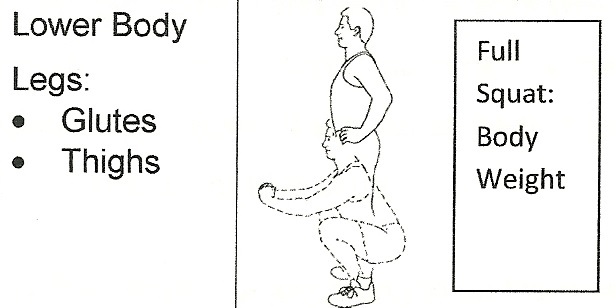 Full Squat: Head is up; back is straight; feet are pointed slightly out. Squat until backs of thighs touch calves. (Easier: thighs parallel to floor). Keep abs tight; balance weight on heels. Adjust arm position for balance. Do 10 reps per set. #5. 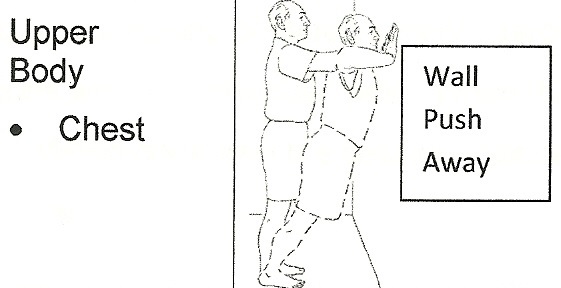 Wall Push Away: Facing wall, place hands (fingers up) on wall about shoulder width apart. With body straight, elbows up and heels on floor, lean into wall. Hold position for 4 seconds, then push away using arms. Do 15 reps per set. #6. Crunch Twist: With legs bent, tighten abs & raise upper body and 1 leg. Twist to touch opposite elbow to raised knee. Alternate sides. Do 15 reps per set. #7. Lunge: With feet hip width apart, step into a deep forward lunge. Front knee should be aligned with ankle; back knee pointing to the floor. Push back leg to straight keeping rear knee raised. Hold this position for 7-10 seconds. Repeat with other leg. Perform the lunge 10 times for each leg. #8. Standing Bend: Stand with feet together and reach overhead with palms touching. Bend body to one side as fa as possible. Repeat on other side. Do this Cool Down Stretch only at the end of circuit session.